In this fast paced action and shooting game you will play the universal soldiers role that is well adapted to any battlefield. Make sure you start shooting before asking questions or they will not hesitate to take you as a prisoner. You start off in Stalingrad with a few weapons available, but you can always pick up the more advanced ones if you like. The ammo isnt unlimited so you need to pay attention to how much shots you miss. Try to keep the plot from happening or you will fail your mission. Defeat every soldier they have and make it back home alive to receive all the praises and the war medals you diserve for helping them in this time of need. Use the WASD keys to move and jump, the mouse to aim and fire, Q and E to switch weapons. 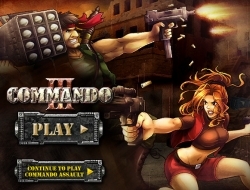 Commando Assault 6.67 between 0 and 10 based on 3 votes.